May 1, 2017 was a chilling day for AU. That day, I walked to our newsroom -- which was closed for finals week -- and called in reporters, editors and photographers to cover a horrifying story: bananas with racist messages on them were found hanging from nooses on the quad. As editor-in-chief, I asked our reporters not to repost a trending Facebook status in support of Alpha Kappa Alpha Sorority, Inc. because I believed that status could interfere with our ability to impartially report on the hate crime. I also requested that our reporting staff not participate in any of the campus protests. My predecessor made the same call last September when freshmen black female students reported that bananas were thrown at them in Anderson Hall. This story was not about The Eagle. It was about the community that the hate crime targeted, women of color, specifically black women, and our student government president, Taylor Dumpson. Yet, the paper became a small part of the narrative, with many of our readers responding to this decision with disapproval via social media posts, emails and in-person conversations. 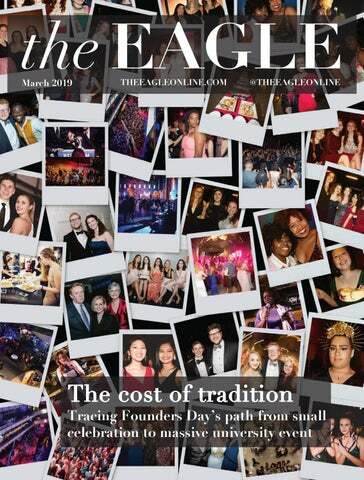 The Eagle strikes a precarious balance -- we are both a student organization and a newspaper. We are part of the community we cover. Yet, as reporters we must separate ourselves from campus events to be able to cover them fairly. On really hard days, we have to put our role as a newspaper first, because that’s the fundamental role we ultimately play in this community. We have to be the voice that holds people accountable and disseminates the best, most accurate information to our community at AU, which proves to be a continuously tough job to do. As John Watson, chair of the journalism division in the School of Communication and The Eagle’s faculty adviser, wrote to me and our staff, we have to put aside our “justified moral outrage” to do our jobs. We did this in May, covering the initial discovery of the bananas, the subsequent community gatherings and the targeting of SG President Taylor Dumpson by a neo-Nazi group. In turbulent times, we can't be both reporters and activists. But we can, and did, dedicate ourselves to reporting the facts and the impact of these events on the AU community. I write from a place of privilege. I don’t know what it was like to wake up on May 1 and have my identity assailed. I also recognize that everyone (myself included) joins The Eagle for different reasons. Some join seeing their role as journalists first, and others join viewing themselves as students first. With this in mind, we spent the summer taking action. We put together a committee to write a comprehensive ethics policy for The Eagle. Several of our staff members stepped up this summer (thank you to Lydia, Sarah, Emily and Anthony) to write a document to guide us every day and in crisis situations like the May hate crime. They poured over more than a dozen professional ethics policies, including those from NPR, The Washington Post and New York Times. They consulted with professors and debated with each other before writing this policy. It’s a work in progress that we hope will guide our staff in the near future. We also recognize that we have a long-term issue, one that student organizations across the University are facing: how can we be more inclusive? As a newspaper, how can we better cover underrepresented communities on campus regularly, not just when an attacker strikes? Drawing on conversations with campus administrators, professional journalists and professors, we hope to create a plan by committee in the coming weeks to address these questions. We will create tangible steps The Eagle can take this fall to become more inclusive as an organization and as a newspaper. We won’t turn away from May’s hate crime. As reporters, we’re responsible for keeping an eye on each new development for AU’s students, faculty, staff and alumni. We will not neglect that responsibility. I welcome your feedback by email and thank you for your deep investment in the AU community.